Joe Fischer knows the murals on the University of Oregon campus well. 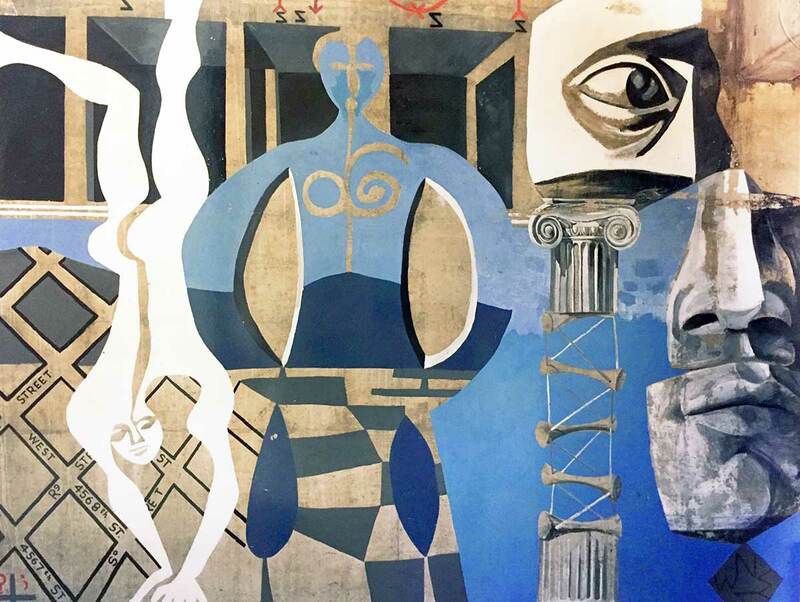 And the painter, retired professor, and double Duck graduate (BFA ’60, MFA ’63) has a favorite: The iconic De Chirico-style “Orientations” mural by Jack Wilkinson gracing a hallway on the first floor of Lawrence Hall. As Fischer points out, the piece, painted by the professor from 1957 to 1960, was originally on the exterior of the building. Wilkinson, the head of the Fine Arts Department from 1962 to 1968, was also an influential teacher for Fischer. He is a part of the large collection of fond memories Fischer holds for his time studying drawing and painting on campus, from a Bonnie Raitt concert at the Erb Memorial Union, to students dancing on the lithography presses in the Art Department, and dedicated professors working late, always available to students. In turn, Fischer would like to give back to the school that shaped him. In honor of his late wife Alona, who passed away in May after 22 years together, Fischer is making a $300,000 gift to scholarships for undergraduate and graduate students in the Department of Art and the Department of the History of Art and Architecture. The gift, he said, is made possible by the estate of his late wife, who never had a chance to go to college. College of Design Dean Christoph Lindner said that such a generous gift makes a future in art possible for students. “One reason I’m so dedicated in giving is the education I received,” Fischer added. Fischer was born in Redmond, Oregon, but grew up in Springfield, where his dad owned a shingle mill. He started drawing when he was six and began attending school. It was the Depression, he says, and they didn’t have any paper or pencils at home. Fischer would draw cars, ships, and even his girlfriend at the time, he said, chuckling. After high school, Fischer joined the U. S. Air Force, where he was an air traffic controller and a graphic artist. He was deployed in the Korean War. “Once they discovered I could do lettering and graphic arts they would take me out of the tower and I would do artwork,” Fischer said. After the Air Force, Fischer was working at a plywood mill in Coquille, Oregon, where he met Dave Rankin (a fellow UO grad), who became a longtime friend and encouraged him to go to school. Fisher went on to spend seven years studying art at the UO, off and on working nights at a plywood mill to make ends meet. He remembers taking printmaking with David McCosh, the unceasing support of his painting professor Andrew Vincent, and even taking a course with sociology professor Luther Cressman, the archaeologist famous for discovering the ancient Great Basin Sandals now housed at the Museum of Natural and Cultural History on campus. At one point, Fischer had to drop out for a term to work. Art Professor C.B. Ryan even offered to loan him the money to stay in school. Fischer didn’t accept, but he is forever grateful for the support. He went on to be an art professor at the State University of New York (SUNY) at Buffalo for 29 years. In the 1990s, Fischer said, he saw the enormous debt his students were taking on for their art degrees. The students’ financial burden was part of his inspiration to make the gift to the College of Design. After SUNY Buffalo, Fischer retired to Longview, Washington, where he met his wife Alona. He has an art studio that overlooks the city through fir trees. He paints there every day. “It’s absolutely my bliss to be painting and being an artist,” Fischer said.